Through completing his internship Jourdan has experienced many different aspects of football development. "Experiences in setting up leagues, festivals and working in different areas of football like adult, youth and women's football"
"He has been involved in a variety of projects from supporting Youth League Festivals, attending FA Licensed Coaches Club CPD events, Youth Development Conference and developing a Youth Futsal League. " In addition to his 20 working days Jourdan attended many CPD opportunities. These were based upon his existing skill set as well as his interests. "The scheme also put me through my level 1 in coaching football which looks great on my cv and now allows me to coach my own team." The Development Assistants have gained many soft skills useful in the work place such as professionalism, work ethic and organisational skills but perhaps most importantly their confidence has improved, benefitting them in all aspects of their lives. Michael comments on the significant improvements seen in Jourdan throughout his internship; "In the short time Jourdan has been with Suffolk FA, he has developed his understanding of sports development and project management skills. His communication and confidence have improved significantly." 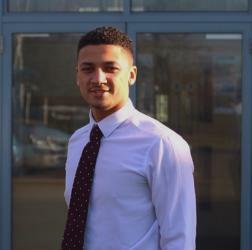 "Jourdan has been an excellent addition to the Suffolk FA Development Team and has added substantial value to the teams aims and objectives"
Before Jourdan had completed is internship he managed to land a paid role with Suffolk FA as an Administrative Services Officer. This is a testament to his commitment to the programme, his desire to learn and develop and to his team working skills. "I am now in a full time role within the FA Structure in which I can hopefully progress through my career."